Becky Lynch turned on her friend Charlotte Flair at SummerSlam after The Queen captured the SmackDown Women's Championship. The Brooklyn crowd seemed to be on Lynch's side, but as she spoke to The Gorilla Position, The Lass Kicker revealed that maybe concentrating on what the fans wanted was part of her problem. "I don't understand what people are saying to me when they say, 'well done' because I went in there with the intention of winning the title and I currently do not have a title," Lynch said. "I have been burning a hole through the Women's Division on SmackDown Live for the past few months and Charlotte shows up and she gets handed a title opportunity and opportunistic as ever when I had that match won, she snuck in and she stole my victory from me one more time. "Again she gets handed the gold and I'm left on the sidelines. So okay the crowd the cheered, but what does that mean when I haven't accomplished anything? I'm left there with one title while she's had seven -- maybe eight if you include NXT -- I'm supposed to be satisfied with that? I'm supposed to be happy with that? That's not enough for me." Lynch feels overlooked in the SmackDown Women's Division and discussed changing her focus in order to attain her desired goal of becoming a champion once again in WWE. "I appreciate that they wanted to see me win, but I didn't get the gold and I think I've been preoccupied too much by keeping people on my side. That hasn't done me any favors. I have to re-evaluate everything and re-evaluate what I put my priorities on. If that was getting the crowd on my side or a friend on my side then I've been doing it wrong. Because there's one reason why I came to WWE and that was to be great and I'm not achieving that. "I haven't dropped the ball once but as soon as Charlotte Flair shows up, it's all about her." The Lass Kicker was the first woman drafted to SmackDown Live during the brand split and she said the show was built around her until Flair joined the Blue Brand. 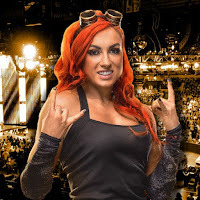 A frustrated Lynch continued wondering what she needed to do in order to stand out and make her point known as she continues to strive for greatness in WWE. "In 2017 I had one title match and it was at WrestleMania and it was a six-way?" Lynch continued. "I haven't been given a fair shot at all. I am the best on this roster both Raw and SmackDown and I've proven that time and time again yet I don't get the opportunity. "Why is that? Is it because I'm not blonde enough? Is that it? Is it because I don't have enough enhancements? Is that it? I'm treated like the red-headed stepchild of the entire Women's Division. Yet I have proved time and time again that I am the moneymaker -- that I am the person that people will tune in to see that they will care about -- that they want to see me win. Yet it's being stolen from me every single time."